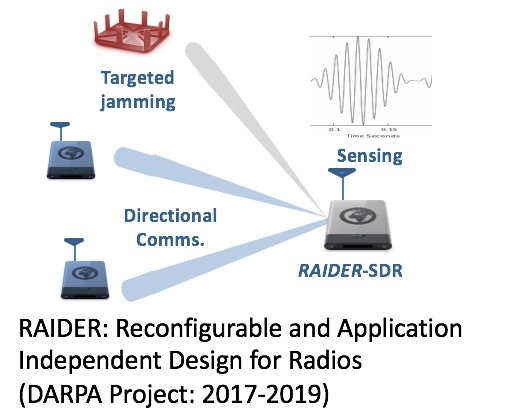 Project goals and research activities: The goal of the project is to build connected mesh of unmanned aerial systems (UAS) that can perform relaying of sensed data over multiple hops to a remote pick up station or data sink. Each link (between any two UAS) can be formed by choosing one of several wireless standards, such as 802.11-based family of radios, LTE direct etc. The overall idea is to sense the spectrum environment, choose the correct channel and select the correct front end, all of which involve computational tasks and reconfiguration of the front-end transceivers. Following this step, we design both centralized and distributed algorithms that can assign UASs to specific roles (such as sensing coverage, sensor wake-up, information relaying within the mesh network). Finally, multiple end-to-end paths are derived between a given UAS and the data sink such that they are maximally separated, and hence the overall network is less prone to jamming. i.e., the UASs that form path 1 are as far as possible from the UASs that form path 2, even if the start and end nodes are the same. A second important goal of the project is to ensure that the UAS are continuously charged, without affecting mission performance. Towards this, we will design a decision framework that will control both the UAV re-charging decisions and also the movement of the on-ground charging vehicles that are confined to existing streets. 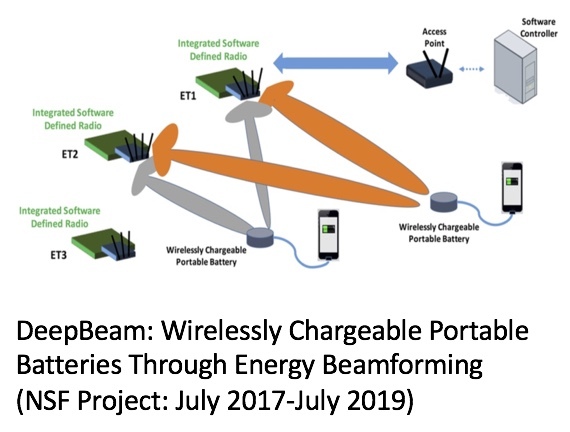 This will ensure multiple such vehicles are correctly positioned whenever charging needs arise and the downtimes caused to the UAS network is minimized. We are also building a testbed with real UAVs to test and validate some of the theoretical results from the project. Project outcomes: In , we have focused on following contributions: First, the problem of UAV activity scheduling is formulated for pre-existing fixed placements, and solved both centrally and for a limiting case distributedly to maximize the network lifetime given a target coverage ratio. The scheme takes into account both positioning and charging issues allowing the UAVs. We have analyzed the distributed scheme and compared to the optimal solution, and the impact of the system parameters like the placement height and the discharging rate. In , we assume UASs are equipped with a wake up radio transmitter capable to send out wake-up sequences, say of 8 bits. 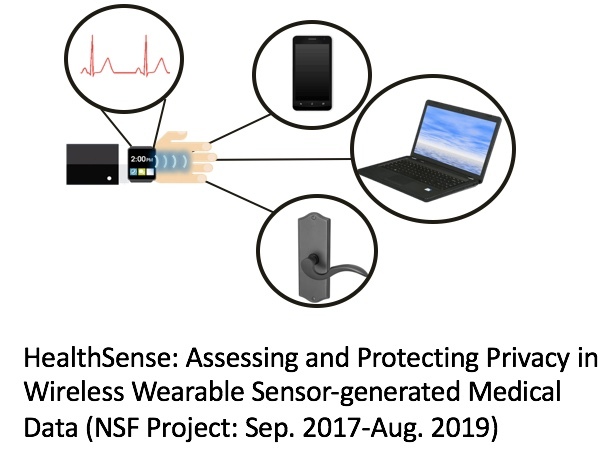 Sensor nodes have a wake-up radio receiver (which we designed and built) that allow them to be semantically woken up when they receive a given sequence (ID-based awakening). 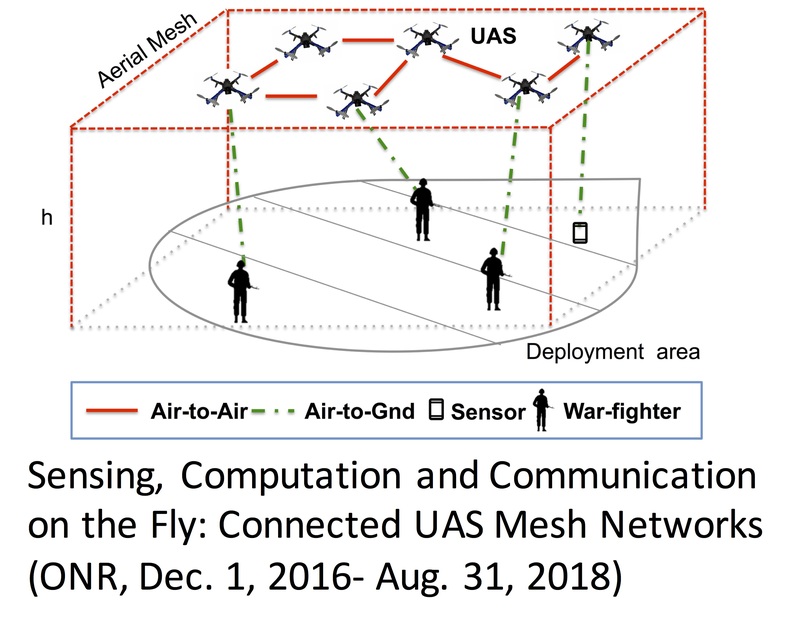 In a parallel systems design effort, we have procured a single UAS and implemented software necessary for building the mesh network, while varying the payload systems in the lab. We are in the process of extending the design to allow connectivity within multi-hop mesh networks. In a second systems design effort, we are investigating agile processing on UASs to support rapidly changing on-board processing tasks depending on the environment. We are prototyping this on an Ultrascale chip from Xilinx with embedded ARM processors, FPGA fabric and a small GPU. Target tasks include sensing of the wireless environment and supporting a variety of different wireless standards. Real time processing is enabled on the FPGA fabric; to agilely switch between tasks we use partial reconfiguration (PR). A. Trotta, M. DiFelice, K. R. Chowdhury, and L. Bononi, “Fly and Recharge: Achieving Persistent Coverage using Small Unmanned Aerial Vehicles (SUAVs),” IEEE ICC 2017, May 2017. 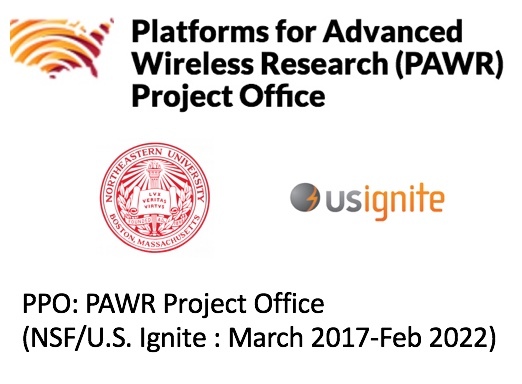 S. Basagni, F. Ceccarelli, F. Gattuso, C. Petrioli, “Abating LPL-Induced Latency with Wake-up Radio Technology,” IEEE/ACM IoTDI, April 2017.